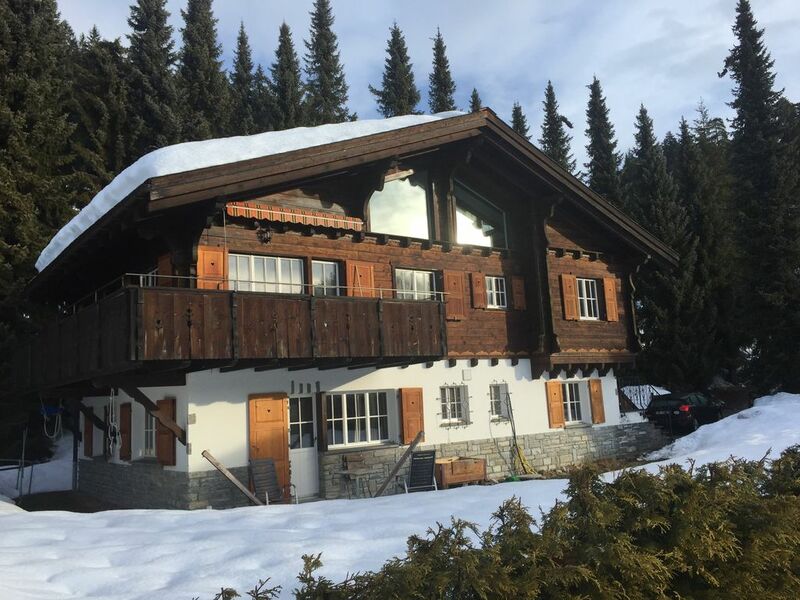 Luxurious Detached Chalet in Laax Sleeps 6-12.Sauna, boot room, garden. The chalet is in a perfect location, walkable to the restaurants, shops, bars and the ski lifts at the Rocks resort and is only 90 minutes drive from Zurich airport. It has 6 bedrooms, 4 bathrooms across the 1st floor and attic, log fire, sauna, boot room, a TV room and wifi throughout. The chalet has a stylish open plan kitchen, dining and living area with wood burner on the first floor that opens onto a balcony with views to the Signina Mountain range. For those who cannot agree on watching the same DVD there is also a separate TV room / library / games room on the ground floor. The 6 bedrooms are across the 3 floors; the beautiful attic room has a superking bed (180x200), ensuite bathroom and a cot. The second floor has three bedrooms with king size beds (160x200) and a bunk room with 2 single bunks (190x80). On the ground floor is a king size bed and single bed that opens onto a patio. Should you wish for extra services such as babysitting / ski guiding / catering / extra cleaning we can also arrange that. We can close off bedrooms to make the chalet available to smaller groups so it can cater from 6-12 people. Ski mad couple who now live in the UK with our children and unfortunately don't have enough time to spend in Laax anymore! The chalet is a family home so you'll find everything you could possibly need. The chalet is approximately 250 square metres so lots more space than a hotel room to enjoy time with your friends and family. Close proximity to the ski slopes and to fabulous restaurants, bars and shops. Laax was voted the best ski resort in Switzerland 3 times in a row at the World Ski Awards. It boasts 224 kilometres of pistes, four snowparks, Europe's largest halfpipe and first indoor freestyle hall, a wide range of restaurants on the mountain and in the valley, which can satisfy every need and which offer all kinds of events and concerts. It also caters for families and advanced levels and for those looking for off piste adventures. toilet, combination tub/shower, This bathroom is shared between Siala and Segnes room. toilet, shower, Shower room for use with Signina and Vorab rooms. toilet, combination tub/shower, Ensuite bathroom for the Cassons room. The heating comes from an underground heat pump - eco friendly! Underfloor heating in communal areas. Radiators in the bedrooms. Large wooden table with plenty of seating. Can provide a highchair if necessary. Extensive CD library. Also able to connect ipod / iphone / ipad to the amplifier. Large private garden surrounding the chalet. Our chalet host Yeni can provide advice on the local area, can provide breakfast, dinner, ski guiding, mountain biking and walking tours, babysitting and probably anything else you would require. All at extra cost. The house is very cozy and it's perfect for familys. It's not far from the ski Elevator and it has a big garden around the house. For Kids very appropriated do run and Play Football outside. The owners are very well installed for small Kids ( chair/bed ...). The open kitchen beside the dinnertable is perfect to cook and be together. The owners are absolutly uncomplicated and very friendly. For bigger Groups the quantity of bathrooms is perfect. 2-4 People could use their own bathrooms.... also the Sauna was lovely. I would rent that house for sure again. Thanks again to the Heaps Family it was a wonderful the saty at your place. This is a great house in a very good location. It comfortably accommodated our group of 10 and the good sized parking area was useful to have. The owner was keen to ensure that we had plenty of useful information beforehand and checked that all was OK on our arrival. The house was well equipped for cooking and feeding our large group. Also, the heated boot holder was very welcome! The bus stop is a less than 5 minute walk away and the Laax base station area has a number of good (but small) bars and restaurants.The ski area itself was fantastic. We managed to leave something important at the house and the owners were very helpful in getting it back to us. Overall we loved our time in Laax and would not hesitate to stay at this property again. We really enjoyed our stay in this beautiful chalet during our skiing holidays. One can tell that the owners care a lot about their place and give others the opportunity to use it as well. It is located in a quiet part of Laax, but easily accessible by car or public transport. We took the shuttle service to the slopes, which comes every 15 min and takes only 3 min. The chalet has 4 double bed rooms, one room with 2 single beds and 3 baths rooms in total. The rooms and furniture were clean and in a good state. Moreover the chalet was well equipped with a big kitchen, a sauna, wifi, a hifi system, a laundry machine and a wood stove which made our stay very pleasant. Altogether a clear recommendation from our side for groups of 8-10 people. We had a wonderful time in this lovely and confortable Chalet. Very convenient and close to the slopes it offers everything you need ! Gets Haus an guter Lage (2 Stationen mit Skibus). Zurück vom Ski zu Fuss in 10 Minuten. Tolles Haus, gute Lage. Betten sind gut. Kontakt mit Vermieter ausgezeichnet. Wir wurden sogar über eine Verzögerung der Hausübergabe per SMS orientiert. Küche gut - ein bis zwei Krüge für das feine Laaxer Wasser wären noch praktisch. Wir waren 10 Personen (Familienmitglieder) und hatten einen unvergesslichen Wochenende. Das Chalet ist mit dem Auto nur ca7 min entfernt von der Skistation, es gibt auch eine Busverbindung die wir aber nicht gebraucht haben da das Parking wie ich finde mit 8-10 Fr noch günstig ist. somit hat das Chalet eine perfekte Lage. Sehr schön eingerichtetes Chalet hat alles was es braucht. Sogar eine Sauna die einwandfrei funktionierte. Die Vermieterin war sehr freundlich und zuvorkommend, hat auch nachgefragt ob wir alles haben oder ob wir etwas brauchen fand ich sehr toll. es gibt ehrlich gesagt nichts negatives worüber ich hier schreiben könnte. wir hatten einen tollen Urlaub und das Chalet war einfach perfekt. Ich denke wir waren nicht das letzte Mal da. bequeme Betten, grosser Esstisch, Beamer (pefekt für Filme schauen) Saune zum entspannen und ganz klar supper Lage. Situated on a sunny plateau above the Rhine Gorge 90 minutes drive from Zurich is Laax. It is a relatively undiscovered gem but hosts major skiing and boarding competitions and features Europes largest half pipe and has 235km of piste suitable for all abilities. You will be spoilt for choice for restaurants from casual to fine dining both on and off the slopes.